The Massachusetts Berkshires is truly a unique environment. The setting is pastoral, with rolling farmland, mature forests, and some of the oldest mountains in the country. The Appalachian Trail passes close to our Berkshires Lodging – evidence of the remarkable opportunities for outdoor recreation that exist in the region. Yet unlike many areas where nature looms large and beautiful, culture thrives here as well. 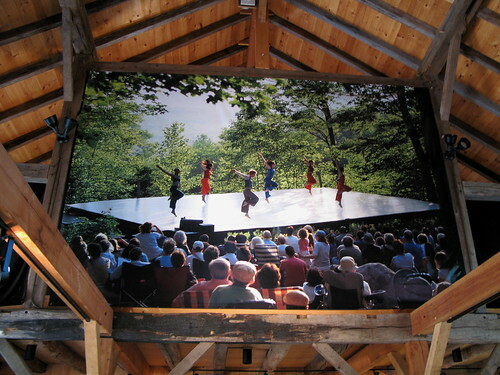 Blake Barn, at Jacob's Pillow Dance Festival. Internationally renowned dancers and musicians travel to the region to perform in several different venues. Tanglewood, summer home of the Boston Symphony Orchestra, also showcases such artists as the Mark O’Connor String Quartet and master story-teller Garrison Keillor. MASS MoCA (the Massachusetts Museum of Contemporary Art) sponsors Bartleby’s Pen, a Friday night series of lively discussions lead by prominent literary figures, and The Clark Art Institute periodically screens Broadway performances. the U.S. debut of 3e Etage: Soloists and Dancers of the Paris Opera. The list goes on and on, for Jacob’s Pillow Dance Festival is all about bringing world-class dance performances to viewers. Check out the Jacob’s Pillow Dance Festival 2011 calendar, and then book a room at our Bed and Breakfast in the Massachusetts Berkshires. We’re located less than 10 miles from world class dance.